Pharr City Commissioner Bobby Carrillo shakes hands with University of Texas Rio Grande Valley President Guy Bailey before the city handed over $500,000 in promised funding for the university's medical school Monday, June 4, 2018, in Pharr. 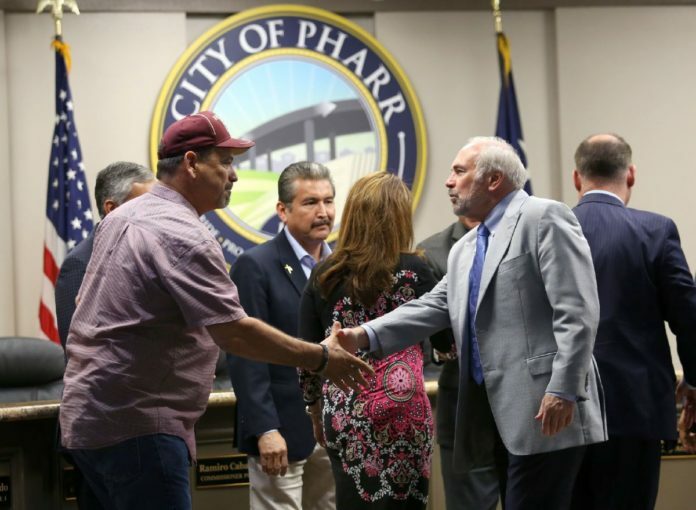 PHARR — Honoring its annual commitment, the city made a $500,000 donation on Monday to the University of Texas Rio Grande Valley School of Medicine. Pharr joins McAllen, which paid $1 million in February to the medical school, and Hidalgo County, which has continued to pay the $1 million it agreed to. UTRGV President Guy Bailey and School of Medicine Dean John H. Krouse praised Pharr’s “sustained generosity” to the medical school. In addition to Pharr, McAllen and the county, Edinburg and Mission pledged in 2014 to make annual contributions to the medical school. Krouse said Edinburg has said it will honor its commitment while Mission likely will not. “It’s with this kind of support that helps us continue to do things for the Valley and its citizens,” Krouse said. This is the third payment Pharr has made since signing the pledge. UTRGV has dealt with funding issues recently — state legislators in May 2017 granted the School of Medicine $54.1 million for the following two years, $7.2 million less than the previous biennium. Because of a lack of state allotment, university officials said local contributions, such as Pharr’s, are critical.